Note: This story was updated on 6/15/2015 to reflect additional benchmarks that were performed at a different location. In one of those annoying quirks we’ve seen in networking standards development, all HomePlug AV2 products are not created equal. There are mandatory elements in the spec, and then there are optional ones that, when supported, produce products that are considerably faster than those without those options. In the case of HomePlug AV2, use of the second wire (ground) in electrical circuits was the optional element that supercharges performance. Products that use the technology, called HomePlug AV2 MIMO, have their own certification program and are just beginning to appear in the market. 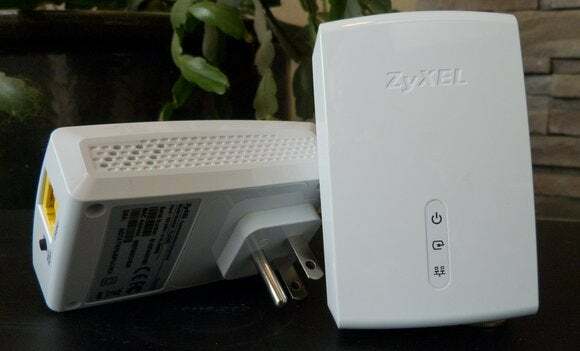 The ZyXEL AV1200 Powerline MIMO Adapter Starter Kit (PLA5405KIT) is one of the first, and we found that it definitely lived up to the hype. 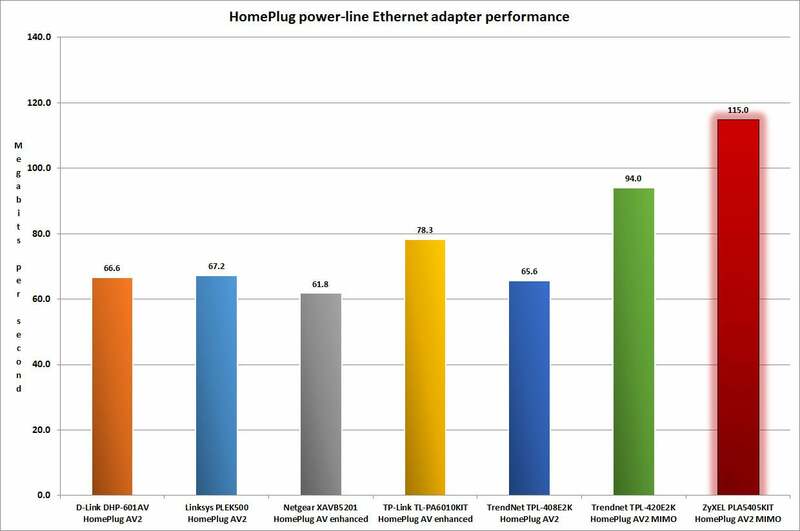 HomePlug AV2 MIMO is fast. The ZyXel PLA5405 outperformed each of the non-MIMO powerline adapters we tested at this location. 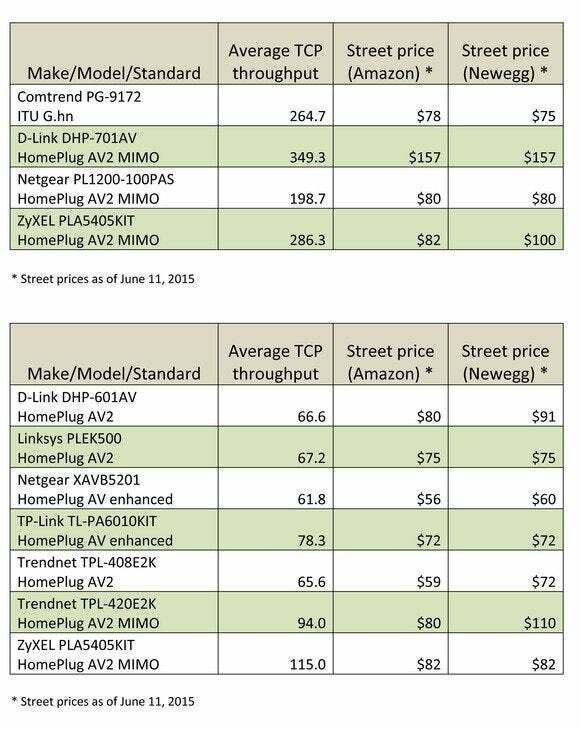 TCP throughput for ZyXEL’s adapters hovered at 115 Mbps—that’s about 1.75 times the speed of non-MIMO AV2 products; in fact, it’s close to the performance of a fast 802.11n Wi-Fi network. Compatibility is a key selling point. If you use one of these adapters to set up the network (i.e. you connect it to a free LAN port on your router), it will deliver those speeds to other AV2-MIMO adapters and it will also communicate with non-MIMO AV2 adapters at their full potential (67 Mbps or so). 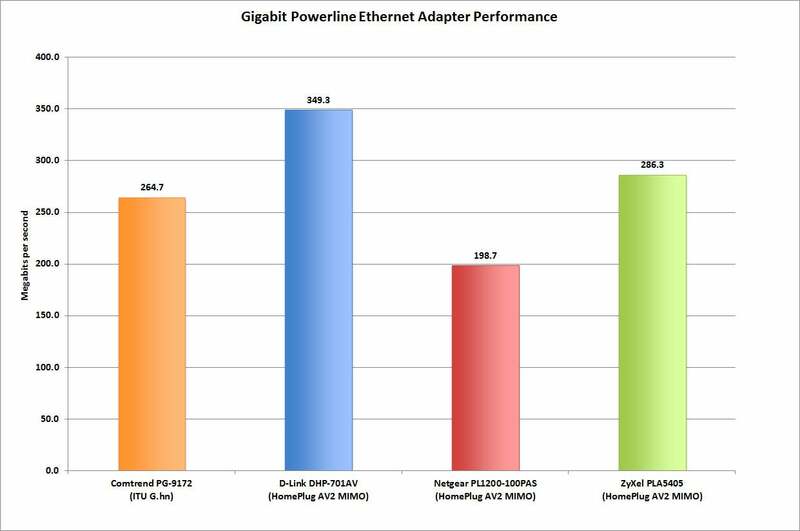 ZyXel's PLA5405 performed even better in our second test location, but D-Link's D-Link DHP-701AV was even faster. Given the product’s stellar performance, it’s too bad ZyXEL chose to get stingy on the included cables, which (like D-Link’s) are only about 40 inches in length. The three-pronged plug also sticks out a bit in the back of the mid-sized adapter, making it difficult to use the second outlet in a typical wall installation. Otherwise, however, the adapters provide the features we’ve seen in other current products: LED lights for power, power-line network and ethernet connections, and pushbutton and password security options. If you routinely transfer large files between computers or storage devices on your home network, you’ll appreciate the speed of an AV2 MIMO network. Right now, however, it’s a luxury item and is priced accordingly. As more vendors bring AV2-MIMO products to market, prices should start to come down; but for the time being, ZyXEL wins the HomePlug speed race hands down and can command the premium. We tested the new D-Link DHP-701AV and the Netgear PL1200 adapters at a different location than the other 7. We retested the ZyXel PLA5405 at this other location as well. ZyXEL is among the first to market with a HomePlug AV MIMO product, so you can expect to pay a premium for these adapters. But if you want speed, there's no faster power-line tech on the market.